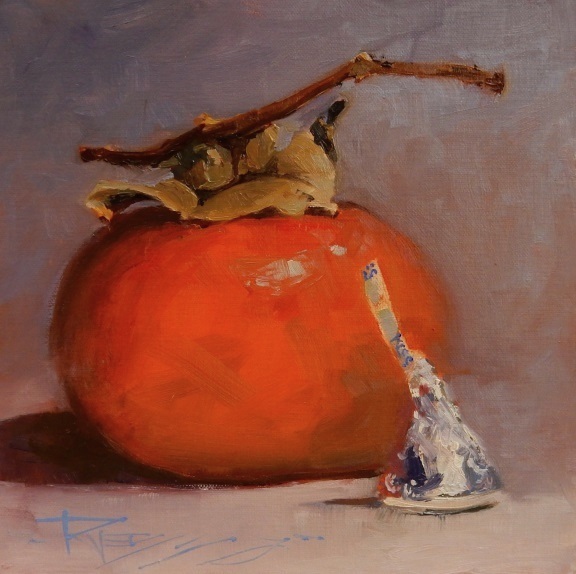 Next in the Persimmon Series. This one is available at the Cole Gallery in Edmonds, WA. I never get enough of trying to render the reflections in silver objects and especially this teapot! 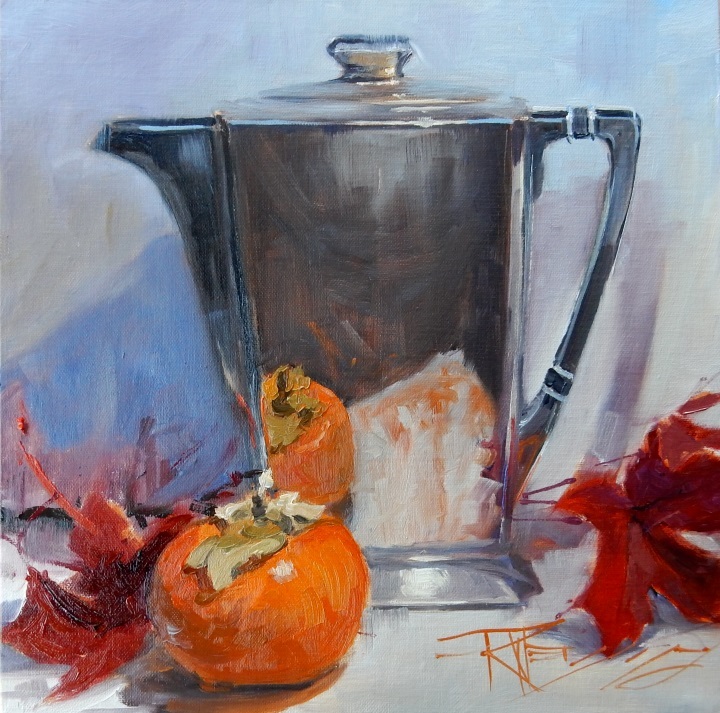 My friend Ruth gave me a handful of persimmons. I love persimmons!...to paint that is. 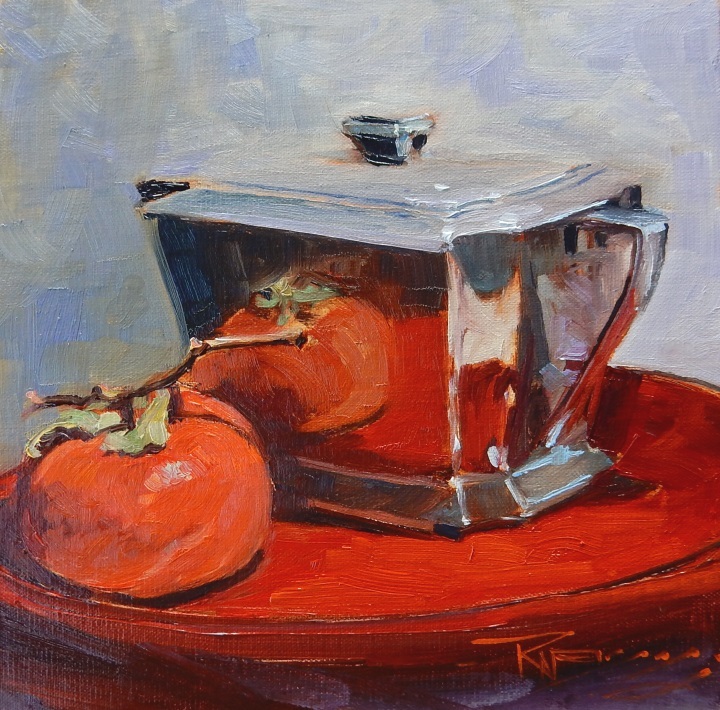 The rich red/orange color makes great reflections and sings against the cool greys of silver objects. I pulled out my vintage silver set to do a series of still life paintings. I added the red dish to enhance the color intensity. It's winter now outside the studio window....cold rain and wind..Perfect time to stay in and create! Hope your doing the same! I took a drive earlier this fall to the Finnriver Farm and Cidery after reading about it in the newspaper. It's a very cool combination farm,cidery,pizza restaurant,community gathering place and more!! The gardens even this late in the season had beautiful sunflowers blooming but what caught my attention were these honkers! They are fenced in between the rows of orchard trees to pick bugs and slugs and leave fertilizer. Great idea! This little goose painting sold at Arts in the Woods Studio Tour this year. If you didn't get a chance to make it you can always come next year!! Always the second weekend in November! Check out the Cultural Arts Website to find out more about AITW! After I enjoyed a pleasant afternoon painting these apples in the field on the Knowles Studio grounds I picked a bagful and made some pies. The apples are small but they pack a punch in a pie! Ha! There are several venues where you can view my recent work in the next several months. 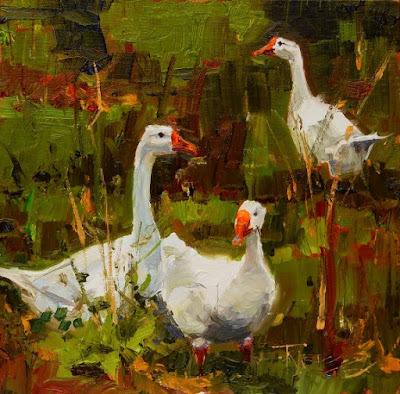 The American Art Co shows Plein Air Washington Artists end of the year group show "The Journey"
The Poulsbohemian Coffee Shop in my hometown of Poulsbo will be showing an assortment of local paintings and prints in January.